After a few weeks packed with fierce Rainbow Six: Siege action we finally know who will take part in the Rainbow Six Pro League Season 2 Finals that will be held in Cologne, Germany on August 25-26th. GurmyWormy and his mates fell short in Season One, one step away from the playoff. However, in Season two, under the yellow color of eXcellence Gaming, they managed to pull it off in an amazing way. With only one map dropped during the entire season, GurmyWormy, Mahman, Geo, Bryan, & FoxA won their ticket to Gamescom and will represent North America as the 1st seed. Vertical Gaming are not new to the LAN scene as all their players already faced Europe & Latin America both in Year One, Six Invitational and Year Two. 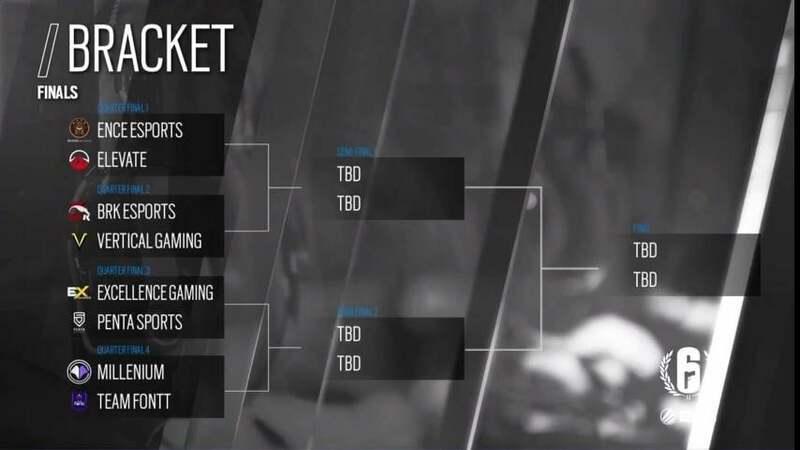 KingGeorge, Avian, Slashug, Yung and Ecl9pse will have to rebuild the pride of North America by taking over BRK esports in the quarterfinals. Elevate was the top team in the world back in 2017 when they were playing on Xbox. After their transition on PC they showed that they still belong in the top. After securing a spot in the Finals in Season 1 they reproduced their masterstroke by taking down no less than FlipSid3 Tactics. SkyS, LaxinG, Shuttle, England and Chapstick will fly to Germany as the 3rd seed of NA and try to break ENCE in the first round. The former Dexterity Team failed to qualify to the LAN Finals in Season One but Gohan, Cameraman, Astro, Muringa & Mav showed that this was a onetime mistake. Not even one map dropped during the full season and Team Fontt will be on stage, defending the Brazilian colors against Millenium. BRK managed to reach Season One Finals under the name of Black Dragons and after changing organization they were pretty dominant all over the season; only falling against Team Fontt. Zigueira and Nesk will have to get all the support from their mates; and with Yuuk, Julio and oNe try to take Vertical Gaming to move forward in the Pro League Finals and may be get a rematch against PENTA Sports. A Rainbow Six LAN Finals would not be complete without Willkey and its mates to represent Finland & Europe. Willkey and Bounssi are the only two players who can pretend to have witness every single Pro League Finals so far. With Kantoraketti, Pannari and Shatte on their side, Willkey & Bounssi secured their LAN spot and took seed #1 of Europe and will face Elevate in their first match. The current holder of the Pro League Title managed to break the curse of year one and requalify to the Finals. Fabian, Pengu, KS, Goga and Joonas will come to Gamescom with the cup and will have to do whatever they can to no give it away to someone else. They will represent Europe as seed #2 and will face Excellence Gaming in the first match. Millenium won the second season of Pro League back in year one and the French squad will try to repeat the success story in this year two. Joghurtzz, Renshiro and Falko already have one Pro League championship to their name but with Liven & siTiZze, Millenium will have the face Team Fontt, the strong LATAM team of the moment, in their first match to get a chance to move forward in the bracket. The Rainbow Six Pro League Season 2 Finals will be hosted in Hall 9 of gamescom 2017, where ESL Arena will be placed. The most prominent pro Rainbow Six: Siege players will meet at the Main Stage to determine who’s the best in the world. Tune in on August 25th and 26th on Twitch to watch the world finest players in action! For the latest updates, follow us on Facebook and Twitter. Join the discussion on our subreddit and Forums!